Avaza will host an annual meeting devoted to the problems of the Caspian Sea. 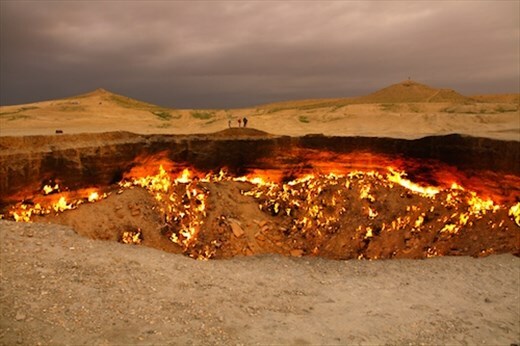 Danish architect proposed to immortalize the gas crater Darwaza that is the most popular natural attraction of Turkmenistan. The crater was formed due to the mistake of Soviet geologists, who in 1971 found a large gas field in the heart of the Karakum desert. It was decided to burn natural gas for environment protection but Crater is still burning. The locals call this place simple - "Gates of Hell". Darwaza Crater attract many researchers and tourists. In the fall of 2013 Canadian researcher George Koronis decided to go down to the bottom of the crater to collect samples. The findings were amazing and proved that it can be a life even at high temperatures. It’s a special bacteria that can be found nowhere else on earth.